Of the various types of RC vehicles available today, the helicopter is often considered the most difficult to master. Although this statment may seem to contradict those "easy–to–fly" claims boldly displayed on some packaging, the inherent difficulty of flying a helicopter lie within the controls and movements helicopters are capable of utilzing, not in the helicopter itself. Similar to RC cars and trucks, RC helicopters require precision control to avoid crashing. Helicopters, though, also include the added challenge of keeping them in the air! Helicopters, like their cousin the airplane, use wings to stay in the air. However, unlike airplanes which use fixed wings, helicopters use rotating wings called rotor blades. As these rotor blades spin, they create lift which causes them to rise or stay in the air. As lift is created, the rotation of the main rotor blades causes the helicopter to spin in the opposite direction of the rotation. This force is countered by the tail blade. RC helicopters usually come in two varieties: hobby–grade, which are designed to operate like a full size helicopter, and toy–grade, which are built for a more stable flight. Flying a helicopter is rewarding, but like most worthy endeavors, it requires patience and dedication. If you want to buy a helicopter and then fly through the sky like an expert the very next day, then helicopter flying may not be for you. Luckily, we have assembled some tips and suggestions to get you into the air in no time at all. Important Note: Our manufacturers implement stringent quality control measures in order to eliminate defects. Although rare, defects do occur. By verifying the operation of the servos and remote, it allows us to identify and replace any defective items before any damage can arise from use of a defective item. As such, any defective items (i.e. faulty servos etc.) will be replaced. However, any damage (crashed or broken parts) arising from the use of defective items is not covered under warranty and is the sole responsibility of the owner, because normal operating procedure requires users to verify the proper operation of these items, prior to operation. 1. Carefully unpack the contents of the package. In an effort to protect the environment, our suppliers work to minimize waste and pack things tightly. Due to their environmentally friendly practices, many customers accidentally overlook or throw away essential components. When unpacking, make sure to fully remove the contents of the package and check every side of the packaging. In order to use the helicopter, you will need to charge the battery. Plug the wall charger into the power outlet. Then, plug the charger adapter directly into the rechargeable battery. Note: If your helicopter model supports a balanced charger, plug the adapter directly into the balanced charger. Then, plug the battery into the balanced charger. 3. 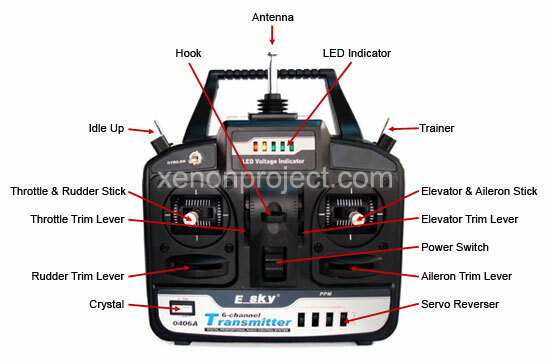 Install Transmitter Batteries / Antenna. When installing the batteries into the transmitter; be sure to use only high quality batteries. Caution: Weak or dead batteries could cause you to lose control of your RC helicopter and cause permanent damage. When you install the antenna, make sure to screw the antenna in securely. Caution: Before you fly, make sure to fully extend the antenna. Failure to do so may result in the helicopter's range being reduced. This may result in permanent damage. 5. Turn on both the transmitter and receiver. With both the throttle and throttle trim set to their lowest levels, turn on the controller [First] and the receiver [Second], then wait for 5 seconds. Caution: This rule of thumb will help prevent damage to your RC, by negating the effects of stray signals from other transmission sources, as well as from incorrect trim settings. Note: Most modern receivers have a throttle cut-off mechanism built–in to prevent the helicopter from flying off unintentionally. Unless you disengage this fail–safe, you will not have throttle control once you turn on your helicopter. In order to bypass this fail–safe, make sure both the throttle stick and the throttle trim are set at their lowest levels for at least five seconds after turning on the receiver. If your helicopter is equipped with a flight mode switch, make sure to set it to normal prior to turning on the helicopter. Although some helicopters do not have this fail–safe built–in, we recommend every pilot start his helicopter using the procedures outlined below. This step serves two main purposes. First, this procedure will help ensure our customers are able to verify that all parts of their helicopter are working. Secondly, this procedure will allow our customers to become better acquainted with the various channels and functions on their RC helicopter. RC helicopters are controlled by their transmitters, but dependig on your particular model, the transmitter can have 2, 4, 6, or even more channels. In order to provide you with a comprehensive review of their capabilities and functions, we have attached a diagram of a 6 channel transmitter. Although your helicopter model may not contain all the features listed in this diagram, the diagram still serves as a good reference for 2, 3 and 4 channel helicopter transmitters. Location: Place the helicopter on flat ground in an open space. Caution: Be sure to test your helicopter in an open area, free of obstructions. You don't want your helicoper to crash and burn before you even take your first flight. The left stick is used to control the throttle (up and down) by moving it up and down as well as the rudder (yaw left and yaw right) by moving it left and right. We will now test the functions associated with the left stick. Procedure: The throttle controls how fast the main rotor blades spin. In order to verify proper operation of the throttle, move the throttle trim to its lowest setting (all the way down). Very slowly, apply the throttle (left stick ↑).As power is applied to the rotor,the helicopter will begin to rise. Now, slowly decrease the throttle (left stick ↓). The rotor speed will decrease and the helicopter will begin to descend. Now slowly increase the trim (throttle trim ↑). As you move the trim up, the rotors should increase in speed. Now return the throttle trim to its lowest setting. Procedure: The tail rotor controls both the yaw (the natural tendency of a helicopter to spin in the direction opposite of the main rotor blades) and the direction of the helicopter by acting as a rudder. To verify proper operation of the rudder, slowly move the stick to the right (left stick →). This should cause the tail rotor to increase in speed and cause the helicopter tail to move to the right. Release the stick (left stick ←), as it is now time to check the rudder trim. Slowly slide the trim to the right (rudder trim →). Doing so should increase the tail rotor speed. Now reset the trim to the neutral postion by centering it. The right stick is used to control the left and right cyclic (tilt of the rotor) by moving the stick left and right. The forward and backward cyclics are controlled by moving the stick up and down. We will now test the functions associated with the right stick. Procedure: Very slowly, apply the throttle (left stick ↑). As the helicopter blades begin to spin slowly hold this position. Now, fully apply the elevator (right stick ↑). You will notice that the angle of the spinning rotors has changed. To best view this angle change, you should orient yourself to the left or right side of your helicopter.Now fully decrease the elevator (right stick ↓). Once again, the angle has changed. While maintaining the same postion on the left stick, return the elevator to the center position. Slowly increase the trim (elevator trim ↑). As you move the trim up, the angle of the rotors should increase. Now, return the elevator trim to the neutral postion by centering it. Procedure: Very slowly, apply the throttle (left stick ↑). As the helicopter blades begin to spin slowly, hold this position. Now fully apply the aileron to the left (right stick ←). You will notice that the angle of the spinning rotors has changed. To best view this angle change, you should orient yourself in front of your helicopter. Now fully decrease the aileron to the right (right stick →). Once again, the angle has again changed. While maintaining the same postion on the left stick, return the elevator to the center position. Slowly increase the trim (aileron trim ←). As you move the trim up, the angle of the rotors should increase. Now, return the aileron trim to the neutral postion by centering it. On some transmitters, there are various switches that are used for different flight modes, such as normal, inverted, and performance flight. Some switches use a channel in order to do things on the helicopter while others change the way an existing channel behaves. Procedure: When this switch is toggled, the idle up or "sport" mode, will engage which creates an RPM threshold. Below which, the RPMs of the rotor will not decrease. This "sport" mode is often used to take off or engage in forward flight. Caution: Accidentally engaging the idle up function during flight or take off can result in serious damage to the helicopter. In order to test the operation of the idle up function, quickly flip the idle switch "up," toward the pilot, then immediately flip the switch back. Procedure: This switch will allow a second remote to take control of your aircraft as long as it's held. The moment the switch is released, your transmitter will regain control. The typical toy-grade helicopter usually has 2-3 channels and can fly up/down, turn left/right and sometimes move forward/backward. This type of helicopter may hover in place but it will not be able to perform high speed chases, loops, rolls or inverted flights. In order to provide a stable flying experience, the tail may not have the familiar tail rotor that is set perpendicular to the main rotor. Instead, they often have fixed pitch (no tilt), counter rotating, dual, main rotors. Since the two main rotors rotate in opposite directions, they eliminate the need for a tail rotor to counteract the natural phenomenon of helicopter flight that forces the body of the helicopter to spin in circles. This helicopter does not have cyclic (tilting of the main rotor) controls for climbing, diving, or doing bank turns. Since they often have dual rotors, they are capable of only level turns. Some models also have a small horizontal spinning tail rotor in order to provide further stability and allow for forward/backward flight. These design elements sacrifice some of the helicopter's movement capabilities, but allow the pilot to perform fewer movements in order to keep the helicopter in the air. Due to their simple controls, slower speeds, and limited aerobatic ability, these helicopters make excellent choices for both novices and younger pilots, alike. However, don't be mistaken. Even with these toy helicopters, it will take some patience and practice to hover, fly around, and land upright. The typical hobby-grade helicopter requires a minimum of 4 channels to control its movements. The variable pitch rotors and other design features allow the helicopter to perform dives, rolls, climbs and loops.. It is these capabilities that make hobby-grade helicopters extremely challenging to fly, but even more rewarding to learn. For more information on how to setup and use your flight simulator, see How To: Install and Setup Your RC Flight Simulator. Don't fly with the sun near the horizon. It gets hard to see. Practice hovering about 6 inches to a foot off the ground. While flying at this range, be prepared for gusts of windsthat can surge your helicopter upwards. Be calm don't overreact by slamming the helicopter into the ground. Instead, slowly lower the throttle and bring it down. When the wind stops, simply ease off the throttle. Practice hovering at 3 feet, then at 8 feet. Do this until you feel comfortable with hovering. Get a feel for the throttle response. Give the throttle a few light taps while hovering. The goal of this exercise is to acclimate yourself to the throttle response, so you can learn not to overcompensate when flying under turbulent conditions. This is harder than it sounds, as most pilots have a tendency to move the stick all the way up or down if they get into any sort of trouble. Take the helicopter for a walk. Start by standing behind your helicopter. Now, from a safe distance, practice "walking" the helicopter. Go from the ground to a hover. Then, "walk" your helicopter for a short distance and gently land back on the ground. Practice turning the helicopter left and right. Try alternating directions as well. Turn left, then turn right, then turn left again. This should help you get a feel for the rudder and aileron controls. Practice flying back and forth between two set points. Practice flying back and forth between two points while having the helicopter maintain the same orientation. Basically, learn to strafe. Practice flying in a small circle very slowly. This is more difficult than it sounds. Flying left to right is easier than flying in and out. Start doing this. Practice slow, controlled descents. Start by hovering about 10-20 feet above the ground. Now gradually lower the collective and watch the helicopter slowly descend. If it starks to sink rapidly, increase the collective slowly until you've regained control. Practice doing slightly bigger circuits while maintaining a slow pace. If you have mastered all the previously listed steps, you're now ready to take the training gear off. They're slowing you down and you're probably developing bad habits by using them for visual cues. Repeat steps 1-12 without the training kit. It will be much more responsive now and much more difficult to see. However, you will see a noticeable improvement in performance capability. Practice going faster, slowing down, then speeding up again. Practice transitioning from a fast forward flight to a hovering position. Most individuals have trouble getting the helicopter near themselves by the time the helicopter reaches a hovering state. Practice in a little more wind. Wind really makes your helicopter jump around. Be on top of it! Practice controlled flight. Try to make the helicopter go exactly where you want it to. Take more authority over the control sticks.